Kate Fletcher is a singer/songwriter and folk musician based in England. 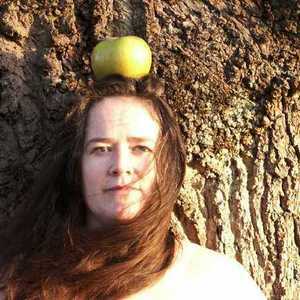 She has a long time interest in the Pagan folk customs and Ancient Ballads of Britain. You can find out more about her on her website: www.katefletcher.co.uk As well as singing, Kate plays guitar, kantele and double reed instruments solo and with her partner Corwen in a duo. www.rigantona.co.uk About the CD, Fruit: She is defiantly a solo artist, affording us an intimate glimpse into her own distinctive and private creative world. Raised on porridge and song in a family of eccentric musicians in Reading. Wrote my first song at 19 and worked with my brother Colin on crafting and recording songs. Lived in France and decided I should have studied music after all. After failing to get into the Foreign Office, recession left me unemployed and so I took to playing music all night under Isambard Kingdom Brunel's railway bridges at Kennetmouth, Reading. Bought a Narrowboat to live on. Everyone said it was a phase. I still have the boat. It's green at the moment. Started teaching voice. Took time out to train as music teacher. Started writing and performing solo. Walked to Spain. Came home by bus and decided to record solo album at last now walking to Spain out of the way. Moved in with Corwen and started teaching in Dorset. Walked across Norway. Just for fun. Recorded my solo album, Fruit, with Robert Harbron doing all the techy stuff. We had a lot of fun in caravans.